Are you an Engager? Fully engage with listeners in real-time while you're on the go! Stay connected with your listeners 24/7 from any device, no matter where you are. 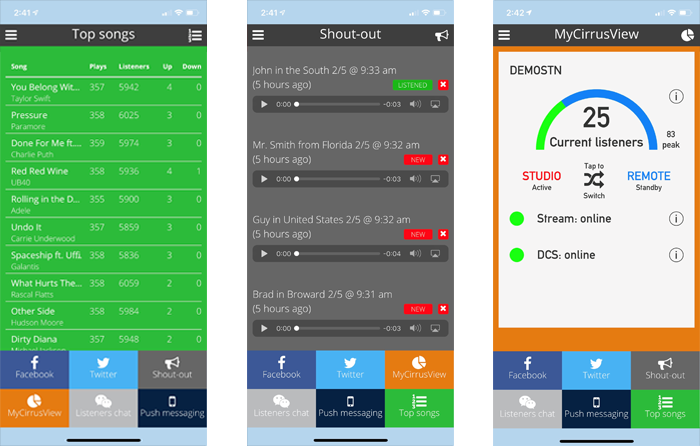 The Cirrus® Engager app for iOS and Android allows stations to monitor audio streams, manage remote DJ settings, chat with listeners in real-time, send push notifications and much more. Best of all, it's free for all streaming clients! You can do ALL this without having to log onto a computer. Download the Cirrus® Engager app and become an Engager today!